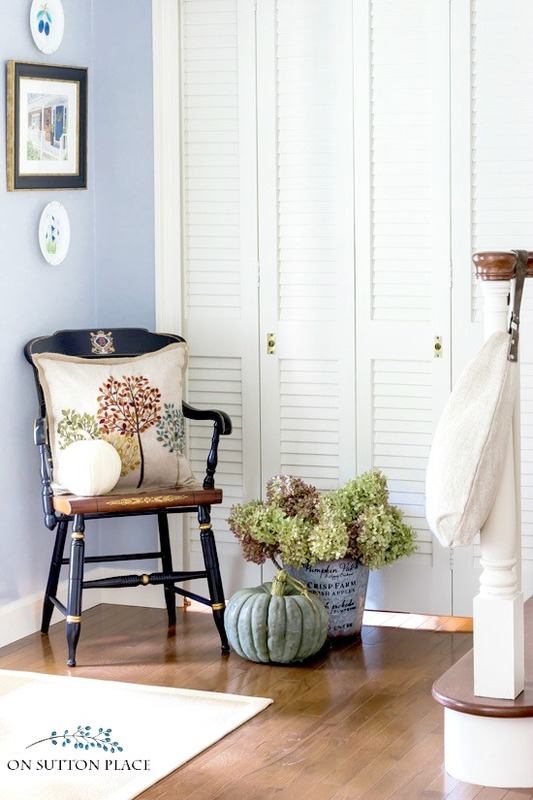 In this post: A Farmhouse Fall Home Tour. Adding touches of fall with seeded eucalyptus, cotton bolls, velvet pumpkins, grain sack pillow covers & more! 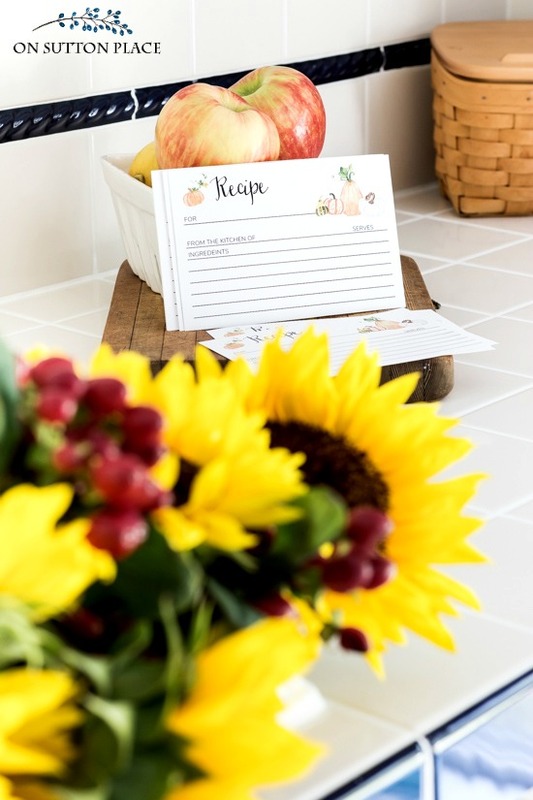 Welcome to my Farmhouse Fall Home Tour…I am so glad you are here! 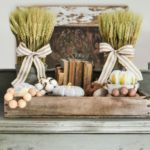 I’m joining a group of farmhouse-loving bloggers and we’ve gathered together to bring you fall decor ideas for all budgets. I want to especially thank Deb, from Seeking Lavender Lane, who put this entire event together. If you are joining me from Inspiration For Moms, a special welcome to you. I have been working towards this day for a month…so I hope you will come away inspired and ready to usher Autumn into your own home. I had planned to share one room at a time, as I got them finished and photographed. Well…you know what they say about the best laid plans going awry. Instead, I’ve got everything right here, all together in one post. First is my tour, then links to the other blogs. *Affiliate links included. See my full disclosure statement HERE. Even a small entry can welcome the changing seasons. For fall, it’s easy if you just keep it simple. Real pumpkins as well as velvet ones, dried hydrangeas in a bucket and a festive pillow add autumn color and texture. No big changes in the living room. I even kept the same pillows that you saw in my summer home tour. I switched out the throws on my blanket ladder, added eucalyptus, sunflowers, cotton bolls and more velvet pumpkins. Like the entry, the extra texture and color added that little touch of autumn I was going for. Gather pillow cover from Farmhouse on Boone. Kelly is as happy as I am that fall has arrived and we’re both ready. Our walks are a bit longer and we’re trying to spend the afternoons outside when we can. I thoroughly enjoyed the summer, but I can’t deny that I’m glad for cooler temps and am looking forward to falling leaves. 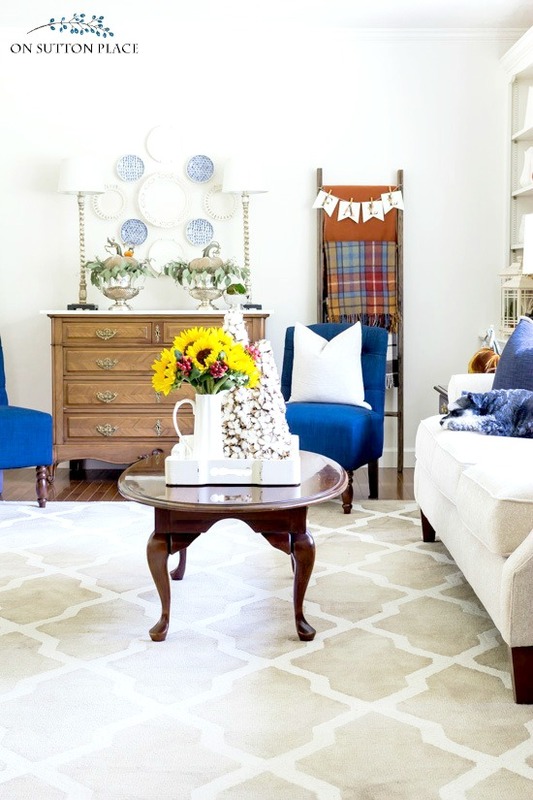 Now it’s time to send you along to the next stop on the farmhouse fall home tour…Sincerely Marie Designs. I hope you also take a few minutes and visit some of the other links. I am very late to be commenting on your Fall home tour. ( I have so many unopened emails). I love the mustard colour in your porch. 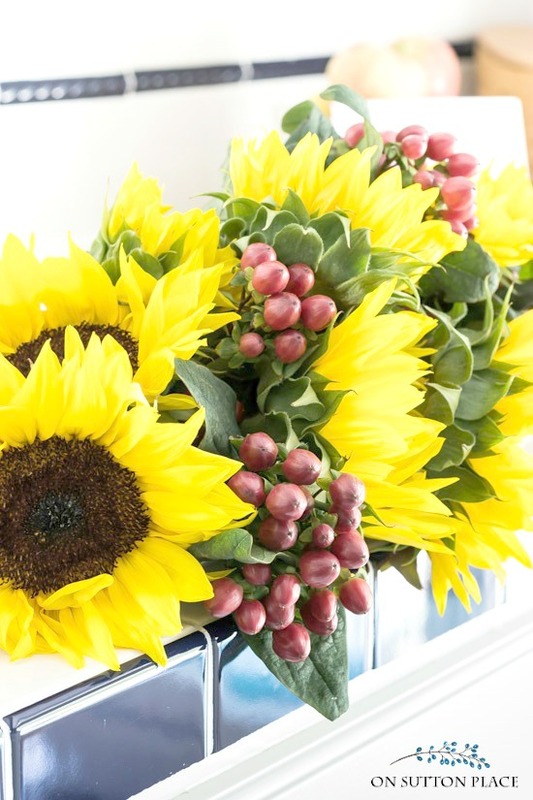 Love your galvanised bucket,table runner & mats, throw ladder, sunflowers, wreaths on back of chairs,Kelly- in fact everything! Love the sunflower and red berry center pc. Always love seeing your decorating ideas! I loved the article on your clematis and will purchase one next spring!! yours is beautiful as is your lovely home decorated for fall thanks for all your great ideas!! This looks fabulous . I would love to win! You have such a beautiful home! Your front porch is so inviting and a beautiful place to enjoy a nice, cool fall evening. Thanks for sharing! Wow! So incredible! I love every little bit of your home tour! You photos are amazing and I love your style! Thanks for a great bloghop! Wow, so many great colors and textures!!! I absolutely love it all Anne!!! Great home tour! I love your design ideas and recipes, and look forward to getting your blog everyday. Thank you so much for sharing!! Everything so warm and cozy! Your home is always gorgeous and especially so with your wonderful Fall touches!!! 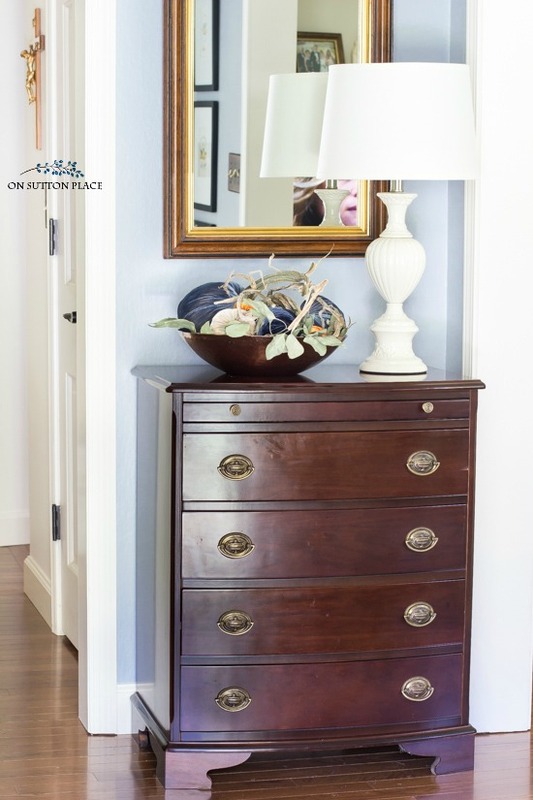 I love the snippets of your various rooms my friend…and as always, fun blogging along with you! It is so refreshing to see your home. I love how you update without painting all your beautiful cherry furniture. Absolutely Beautiful. I so enjoyed the tour of your lovely home. Thanks for sharing . How much of the grain sack fabric did you need to cover the eight dining room chairs? I have the same chairs and love the look of the fabric. Hi Trish! The fabric is wide enough to get two chair covers cut from the width (side by side.) You may have to juggle the stripes a bit but it will work. So if you have 8 chairs, you would probably be safe with 3 yards of fabric. Please measure though to make sure…hope this helps! Ann, you hit the mark again. I love everything that you do and thanks for sharing. Love, love your autumn decorating! So very peaceful and inviting. I knew before I even opened your page that I was going to love your tour, Ann! 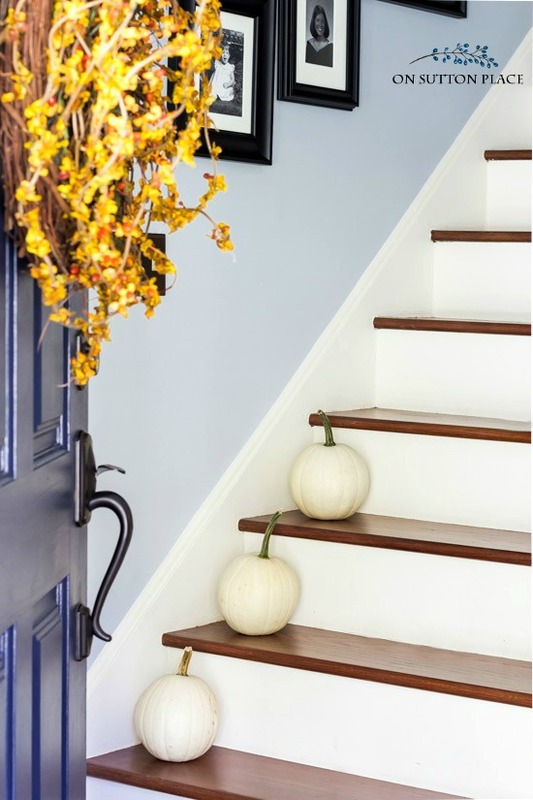 Your house is always gorgeous and your subtle Fall touches just added to that. My very favorite thing is your copper collection in the blue cabinet, perfection! I love the Wooden Wagon Pumpkin Planter. So cute!! Ann, your home is just one of my favorites. It’s always so classic and timeless! 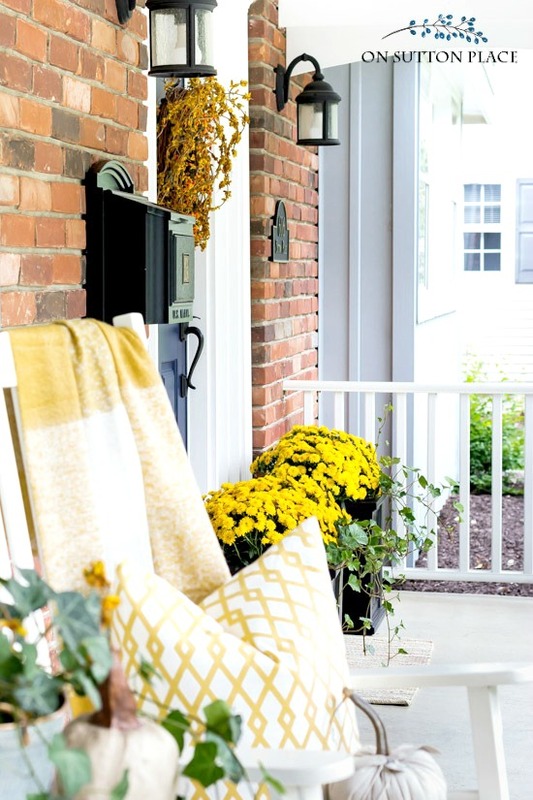 I love every single fall detail, especially that front porch! Beautiful tour, friend! Your home is beautiful, your photography amazing but your dog was the cutest thing on the blog today! Thanks for sharing, Ann. Your home is beautiful. Beautiful. You have a gift. Thanks for your generosity in sharing your talents. Everything looks gorgeous. All pictures are beautiful. 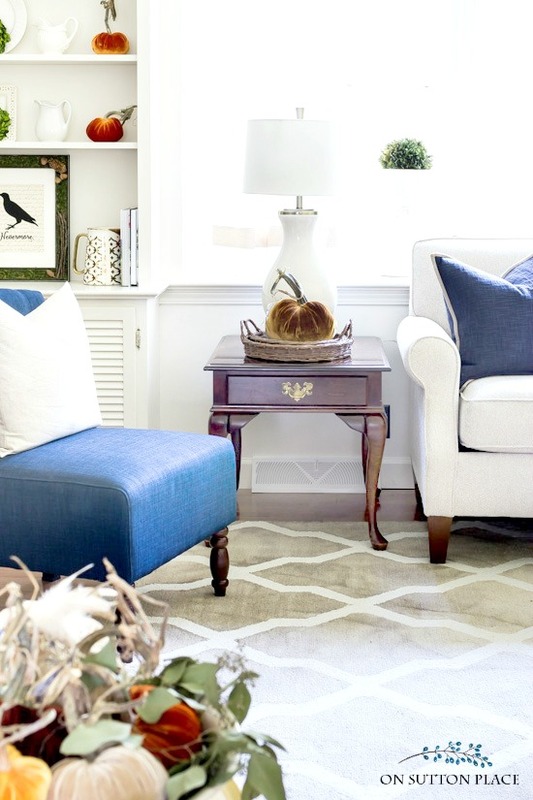 I like this farmhouse fall home tour. I love how you have such beautiful accent pieces without it looking cluttered. It’s an inspiration to look at your home. Ann, everything is absolutely beautiful as always. Kelly is adorable. I am so happy fall is coming. I think it is my favorite season of the year. Thank you for all of your great ideas, delicious recipes and lovely printables. You are always so generous and I am very appreciative. I love Kirklands! I am in love with the Garden Blooms Canvas Art Print! I visited Kirkland’s and I LOVE the “Choose Happiness” pillow!!! Hi Ann, I browsed your beautifully appointed autumn home 3 or four times, and each time I saw something wonderful I had missed the time before. I don’t what else to say except, “It’s perfect! I love it!” I have learned so much from you about decorating and styling my home, particularly with seasonal decor. I’m still surprised how you find JUST the right elements to accent the decor already in the room and how you ALWAYS decorate “just enough”. I have found that to be one of my biggest stumbling blocks when doing seasonal decorating. You mentioned you didn’t “do much” in your living room, yet, it sings, “Autumn”! Your dining room table and chairs…..just gorgeous Ann. Thank you for a lovely tour. As always, give your Kelly a big hug! Hi Ann, nice tour. I love all the Fall decor you’ve displayed. I’m excited about exploring Kirklands as there is a store near me that I’ve never been in. Seeing all their beautiful things on your blog and their web-site has me really interested. I would love to enter the fabulous give-away but I can’t get all my entries because it won’t let me go past the one for Twitter which I have never been able to join. I’ve tried several times and it will never accept my phone number. Is there a way to bypass that entry and go on to the rest? Ann you do a great job pulling all the Fall decor together. Thanks for the inspiration. Love all the touches tucked in everywhere, The wreaths in your chairs and the runners on the table are my favs! This all looks so beautiful, Ann! 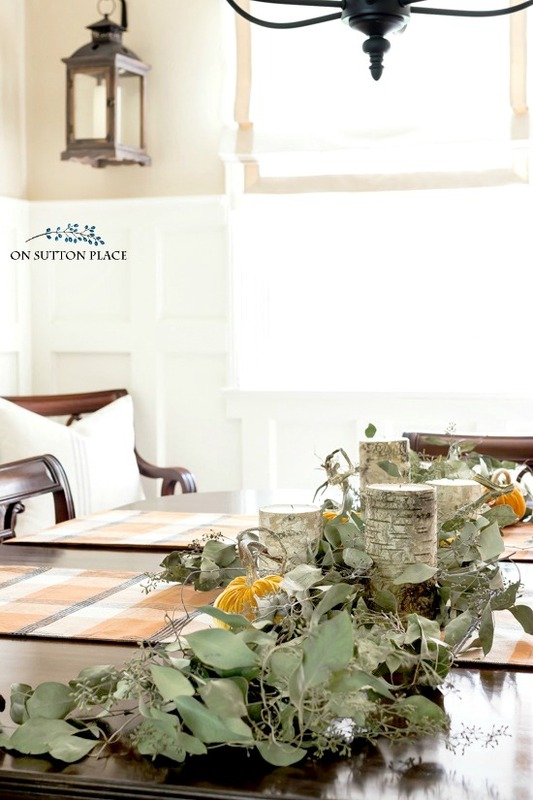 The Gathering Place collection is my favorite at Kirklands! Thank you for inviting us in and view your lovely fall home. Everything is perfect as usual. 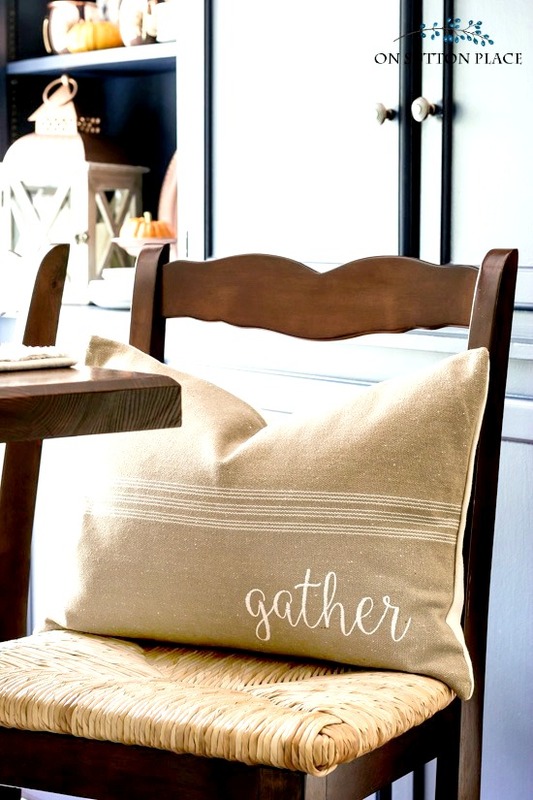 I love the new “gather” pillow cover. Thank you for introducing that etsy shop. Her workmanship looks beautiful. Just took out my fall pillow covers I purchased from you some years back. Just lovely. Ann – you home is so beautiful and is truly inspiring! I love all your fall touches! My favorite art piece is the Birch in the Fog Canvas Art Prints. I have just the right spot on my wall for them. Ann, you’ve got the most lovely home! LOVE seeing it all cozied up for Fall! SO pretty! Gorgeous!! 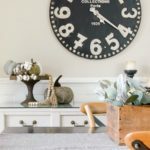 I love how you mix traditional pieces with farmhouse finds throughout! 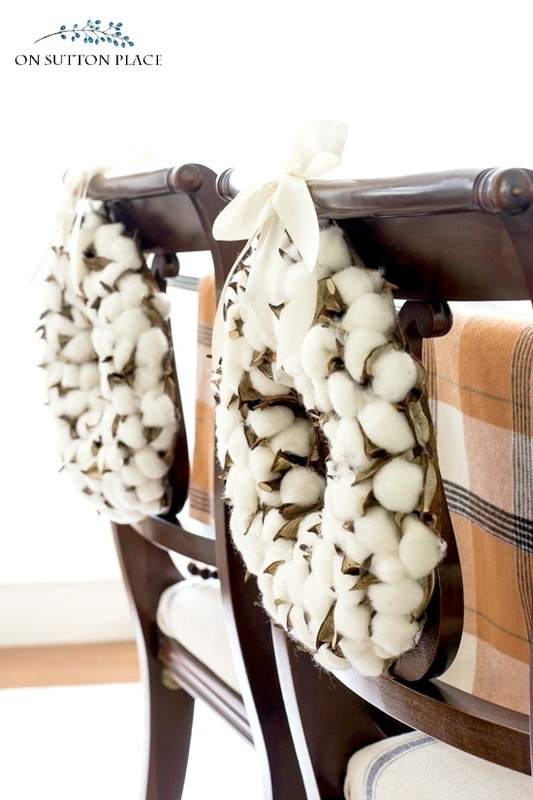 The cotton wreaths are so cute on your chairs! Enjoyed the tour. Especially like the dining room table. That was a very enjoyable tour thru your beautiful home. I know you are enjoying all the redo and new. Thank you for the chance at the gift card and have a great day. So pretty, Ann. 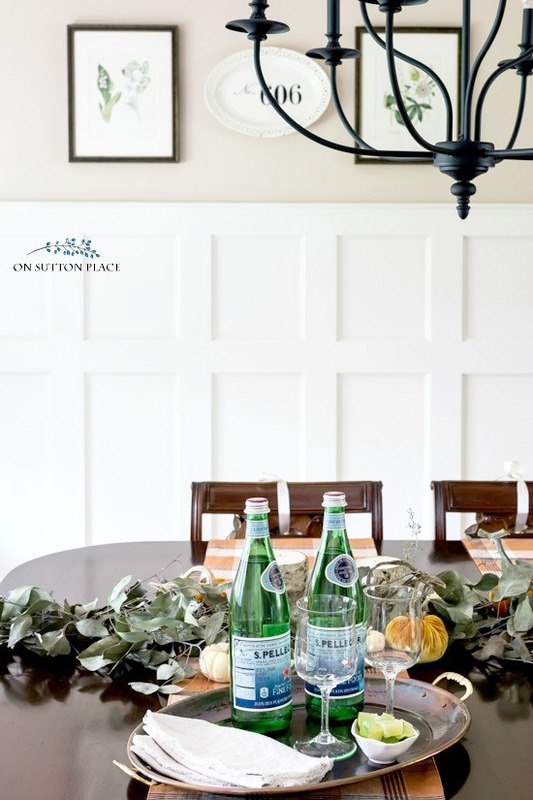 I have followed your blog for a couple of years now, and you always manage to give your decor a nice seasonal twist while keeping things simple and fresh. I enjoyed your Fall home tour. Your home is just beautiful; it’s perfect in every way. You have an eye for simplicity and grace in your furnishings and decor. My husband and I recently visited friends in northern Ohio. Your area is lovely with pretty towns and homes. You are fortunate to live in such a wonderful part of the country. Thanks for all your efforts in creating such an enjoyable blog! It’s my favorite for sure. 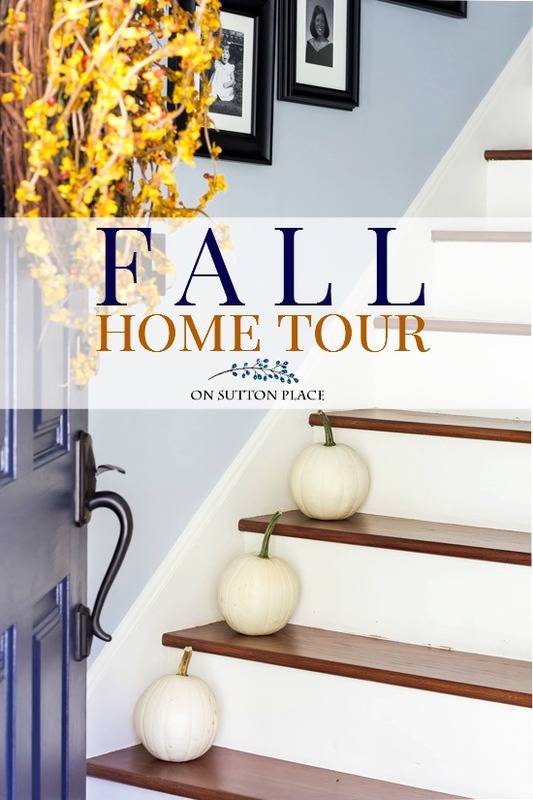 Your fall home tour was fabulous. Everything looks so warm and cozy! Fall is my favorite season. Oh, my, you have a knack for asking fall look so warm and cozy, it warms the heart! 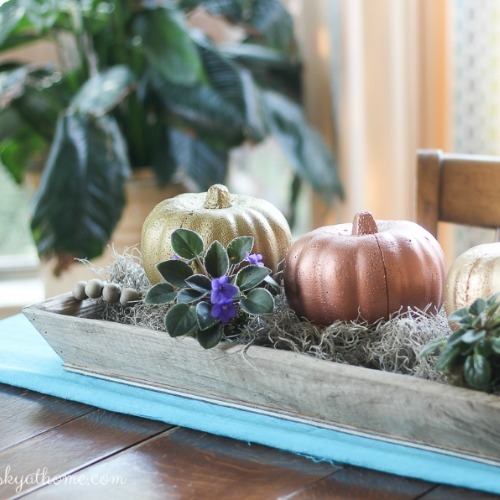 I absolutely LOVE their galvanized pumpkins! I am a sucker for anything galvanized, and I would love to have a set of them to display during the fall. Absolutely love everything you do. Your home is beautiful. 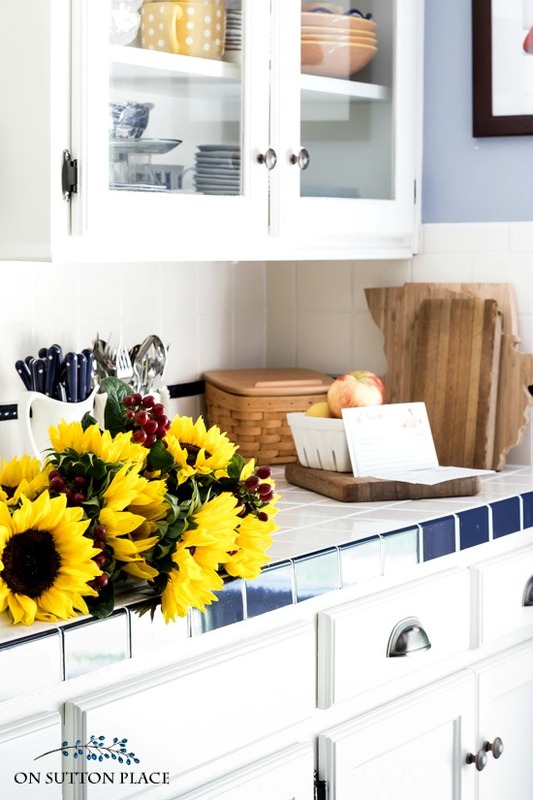 What is the paint color in your kitchen. I know it’s blue but what brand? I can’t wait till you show us Thanksgiving and Christmas ideas. Ok, Ann…you are going to move out of your home so I can move in!! I wouldn’t change a thing because everything is perfect. I especially love those runners and the velvet pumpkins. Happy Fall! Thank you for all the great ideas, but I have to tell you we have such similar tastes. My tables are the same, my dinning room set is the same, the white sofa, with the same fabric. 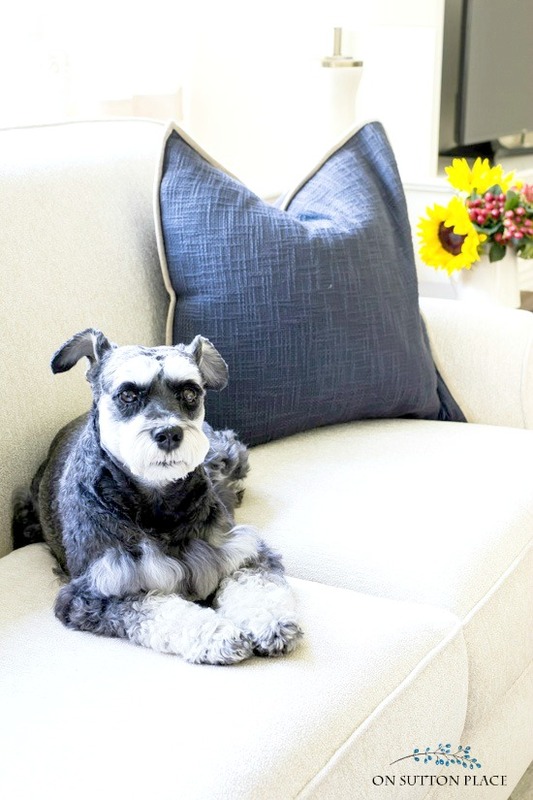 And I have two black schnauzers who loved my white sofa. I did change out the cherry furniture when we moved into a cottage style home, on the bay. Love it!! Love your home everything is so so pretty !!! Ann,everything looks fabulous.Loving the velvet pumpkins and the wreaths on your chairs. Ann, Your home looks welcoming and inviting. I can’t keep up with you, I do a little each day. I am in the process of filling jugs with colorful dried leaves and flowers. That is a pretty exciting Kirkland giveaway. Many thanks for your inspiration. Ann your fall décor is lovely, you’ve done a fabulous job adding simple little touches of fall to every room, less is more. I shop at Kirkland’s every chance I get, their lanterns are just beautiful for fall decorating. WOW! Lots of amazing items! I’m looking for some Parson chairs for my dining room and I’m loving the Sand Parson Chairs. 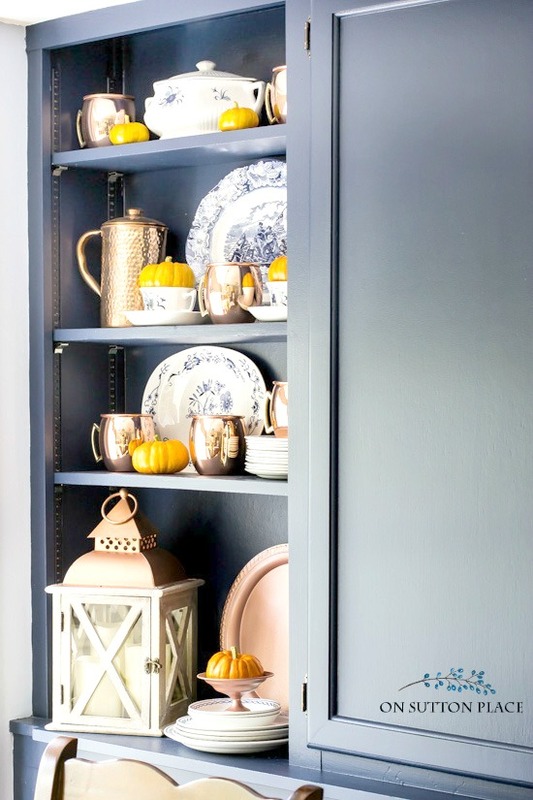 Thank you for this Fall decorating inspiration. Your Home is lovely and so inviting. And thanks for the recipe card printable. Just what I needed. Ann, it’s all just beautiful! I know it’s a lot of hard work preparing for the tour. Thanks so much for sharing. Love love all the cotton touches you added!! 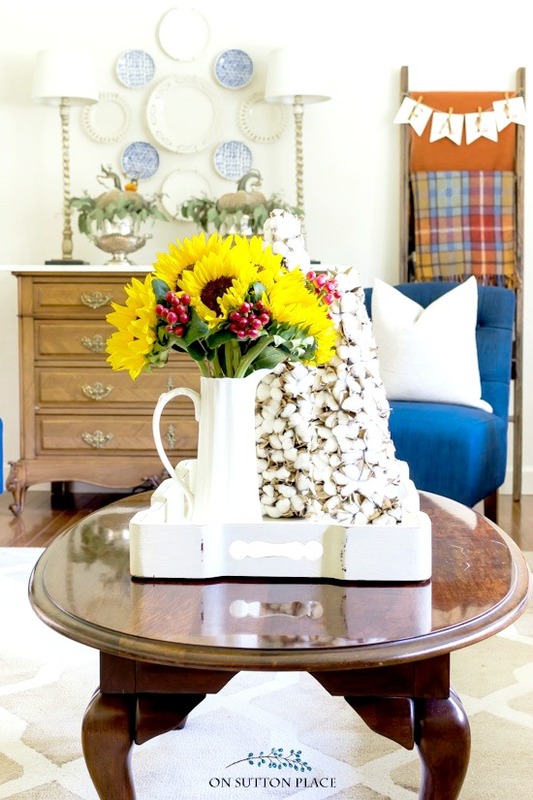 Ann, i love how you’ve used sunflowers throughout your fall decor. They are such a wonderful pop of color. And mixing them with berries is a great pairing. Such a beautiful setting in every room. 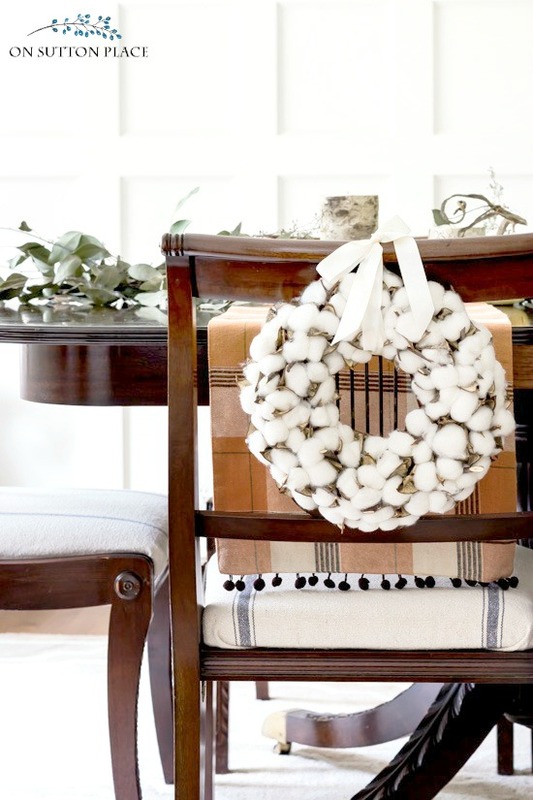 The cotton boll wreaths on the backs of the dining room chairs is a great touch. Happy to be on the fall home tour with you. Love all your decorating ideas! Love Kirkland’s! favorite product @ kirklands.com: bronze triple-orb metal floor lamp. I saw it at the store last night and am in love! Your place is beautiful, as always. Definitely my kind of style. 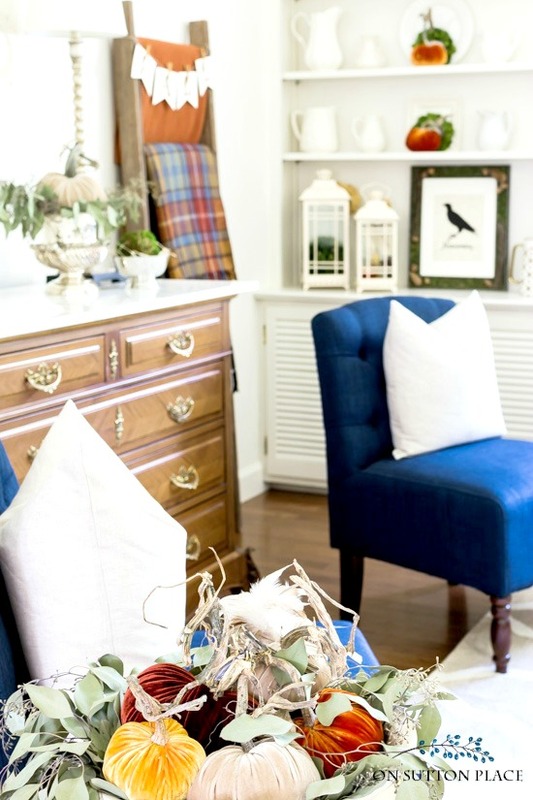 I love that you do not ” overdo ” ” clutter” your home with decorations ! 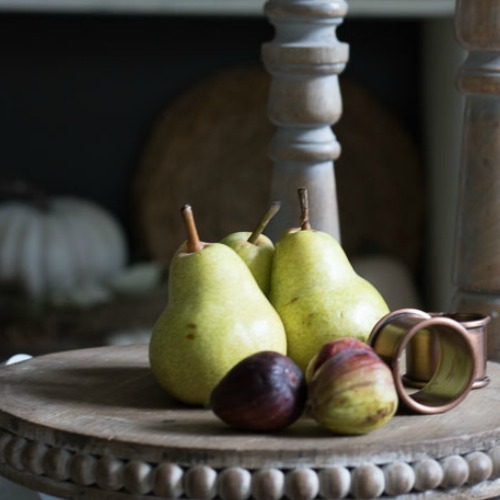 I always believe less is more and your home has a perfect blend of fall decor that makes it truly beautiful ! Your home is very beautiful, are so are all the things from Kirklands! I would really love to get some new furniture. I like the Reggie Sofa in grey. Thank you all for the lovely ideas! I’m going to incorporate several into my fall decorating and definitely going to visit Kirklands. Again, thank you all for sharing your homes, you are blessed. Love your home, Ann! It’s all just gorgeous, down to every single detail! So happy to be touring with you! I should not have opened this email while I am at work. I’m going to think about decorating for the rest of the day(haha). I can’t wait to finish fall decorating and now I have more ideas thank you Ann. Your home looks great for the season. Your home is always so beautiful! I love all of the fall touches you added! Your porch is dreamy!! happy fall! Ann – I think you are my all-time favorite decorator. Everything you do is so classic and timeless. 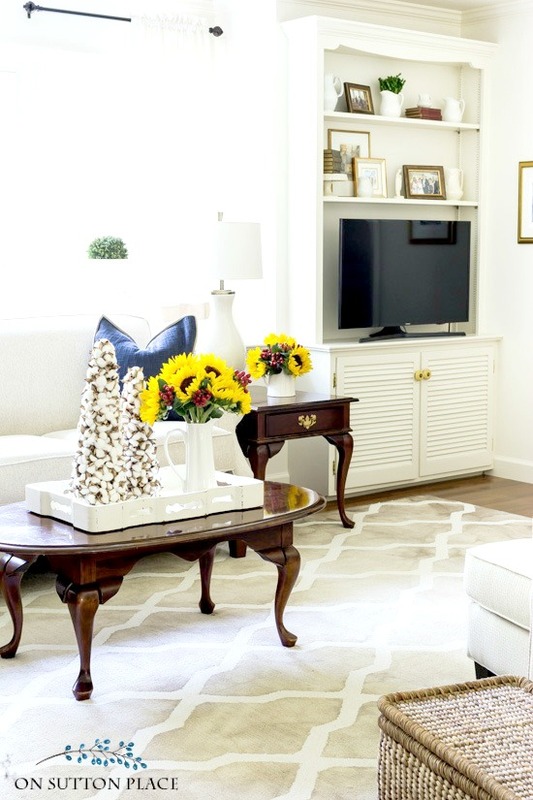 Your home looks stunning as always, I’m particularly crushing over the cotton wreaths! Ann, I had missed seeing your beautiful copper accent pieces in your kitchen. They look fabulous with the colors that you use. I spotted the cutest camper figurine on the Kirklands website. I MUST get it, and you’ll see why later!!! Always love visiting your home and your fall decor is perfect. I especially like the dining room and the kitchen. Oh wait, I love it all! Nice giveaway from Kirkland…it wouldn’t be difficult to find many gorgeous things in there. Love your beautiful Fall Decor, especially the galvanized pumpkin bucket with the dried hydrangeas!!!! Kirkland’s is a fabulous decor store and I hope to win the awesome giveaway!!!! So pretty, inspires me to get with it and decorate for fall! Enjoyed seeing your ome decked out for fall – very inviting! Loved your tablescape. Everything is so beautiful. Your dining room is stunning. You put so much time into your blog it truly shows. Beautiful! Always an inspiration. Love your free prints. Love the fall decor in all the rooms. Thanks for the free fall printables. And, for the Kirkland give away. Ann, hands down…this is AMAZING! Your home is so breath taking, and I can’t get over all the unique finds you have for your Fall decor. Just adored those cotton wreaths hung on your dining room chairs. Thank you so much for taking part in this tour! Oh, Ann! Your home is beautiful in any season, but you’ve outdone yourself for Fall. I LOVE the way your decor is fresh and up-to-date but is very livable. Your house doesn’t look like a museum; it looks like a place of love! Thanks so much for the chance to enter the Kirkland’s giveaway. 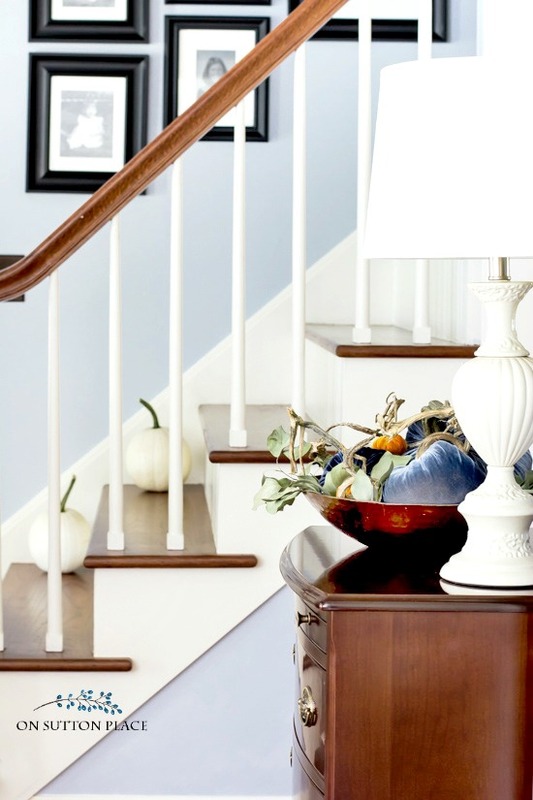 I’m especially admiring all their lanterns–just right for fall decor! Richella…thank you so much. Your words just totally made my day. Thank you for taking the time to leave such a lovely comment. Happy Fall! I just popped onto Kirklands for the first time, joined the K club and looked around. I am in love with the Prescott table lamp, and I think I’m going to order it! 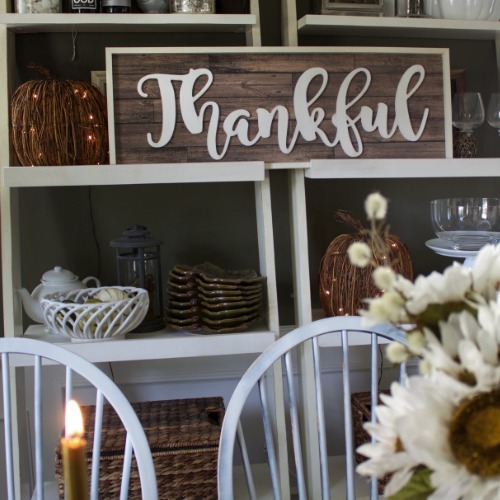 You did a beautiful job decorating your home and adding all the gorgeous Autumn touches. Love all your gorgeous rooms! So creative but very elegant and warm! Your home is lovely, Ann. I have slowly been transitioning our home from summer to fall & now that I’ve seen your home, it’s full speed ahead! Ann, your home is full of Beautiful Autumnal goodness:). I’m loving the assorted sizes and colors of the velvet pumpkins sprinkled all over your home:). A wonderful time to walk Kelly too! Thanks for sharing your home with us, Ann. Beautiful, warm & inviting! Ann, never cease to amaze! Fall decorating at it finest! Ann, I’ve always loved your kitchen. The tree pillow in your entryway caught my eye. Perfect for fall. Kelly sure is a cutie-pie! Thank you again Ann! I wish you were my neighbor and you could stop by and give me a hand. Your home is welcoming and fall looks good with your new added home improvements. Then again, I like blue probably as much as you do. I love the way your photos inspire me. I went for a walk in a friend’s field this weekend and cut broom grass, yellow rag weed, purple flowers and then snipped some of my dry Lucifer leaves and hydrangeas. I put them in a crock and placed them on my front step. Welcome to autumn! KIrklands always has great item. My favorite is the wooden pumpkins for my mantle! My favorite item that is new at Kirklands, although it was so hard to choose was the Lighthouse Dream Art Canvas. I know everyone would probably be choosing something for fall, but I live in Florida and always love finding more art to add to my coastal cottage style. Thanks for the giveaway. 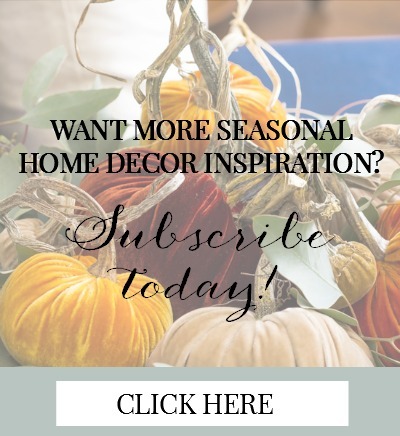 Your fall home decor looks wonderful! 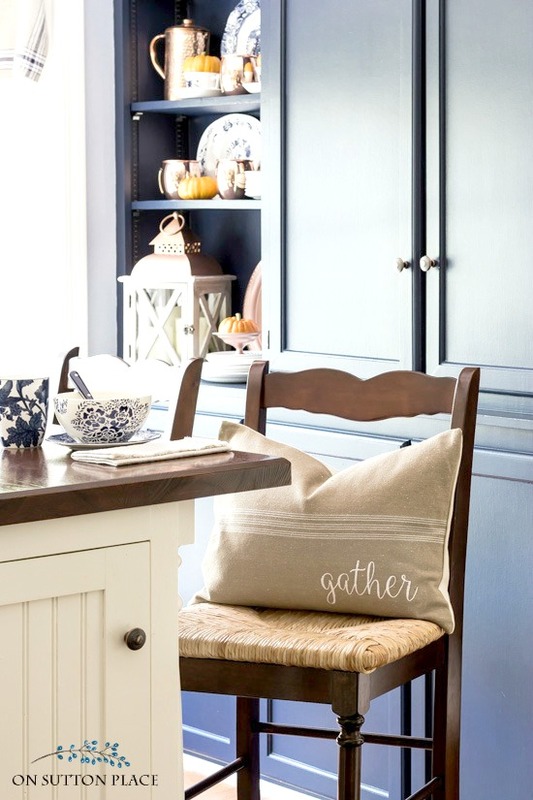 My favorite item at Kirklands is the Farmhouse White Sliding Storage Bench. I would love it in the mud room! Your home is beautiful and so clean I told my husband I think we could eat off the floors!!! Lol!!! I love fall and your home reflects the beauty of it! Enjoy the season, Ann. The “Tweet” link is not there; only asks for email address, again. How do we follow bloggers on Instagram when there are no links? Thanks. Hi Deborah…I have asked our Kirkland’s rep about the rafflecopter entries. I will let you know as soon as I get an answer! I worked around it and went to eat bloggers site to follow their instagram accounts. Thanks! Love Kirklands – the fall products are the best. My favoirite are the pumpkins. Always love your home but not a fan of all the ads …sorry! Hi Bev…since you are an email subscriber you can read my posts with no ads if you open the email the day you get it. I leave the ads turned off for 24 hours after I publish a post. After that, I have to turn them back on. I hope this helps!